Hello friends in the blogosphere! Today's theme on Viridian's Sunday Stamps is "civic architecture" and I have to admit, that got me quite excited (Bridges! Monuments! and Buildings, oh my!). So what to choose? It has to be said that lighthouses are awesome. This first set of stamps are totally awesome because not only do they depict lighthouses - there is a map image of the location of the lighthouse in the stamp's background. And everyone knows I love a map on a stamp. Nicely designed stamps, right? Lighthouses are such striking structures, there is something mesmerising about them (it could be the almost hypnotic effect of their light beams being thrown out and around, but I think it is more than that). They are built in precarious locations on rugged cliff-faces, with views of the wild ocean. Intrinsic to their existence is the reminder of the dangers of seafaring. So there is something poetic and romantic in the very nature of the lighthouse. Lighthouses are just incredible - they defy the elements. This second set of stamps was released in 2006 and shows lighthouses built in different eras. Although the occupation of lighthouse-keeper has been made redundant by new technologies and solar power, not too much has changed in their design. Part of what is captivating about lighthouses is that the elegant towered structures represent, in a way, the incredible skill of the people who managed to engineer such a structure in what is usually a geographically hostile and isolated location! 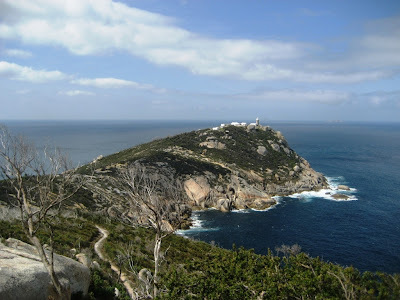 Two years ago my friends and I did a wonderful day hike into the lighthouse at Wilsons Promontory National Park. The lighthouse and its little peninsular are now officially run as a national park, and the old lighthouse keeper is employed as a park ranger, who takes tourists (like us) up the lighthouse, to hear about the operation of the lighthouse, and what his daily life as a lighthouse keeper was like in times past. 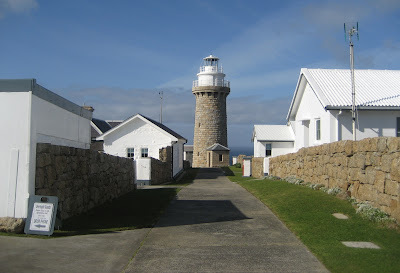 The lighthouse and its associated cottages were well worth the six-hour walk in to see it. I like the thought of hiking to many more lighthouses in the future. Currently near the top of my list of "lighthouses to visit" is the one at Gabo Island, off the east coast of Victoria. If anyone has any suggestions of other lighthouses I should add to this list, I would love to hear them. Hope you have enjoyed looking at and pondering lighthouses with me this week. To see how others chose to explore the topic of civic architecture, check out the other blogs through the Sunday Stamps button below. It is interesting to see the different styles of lighthouses and the ways they are depicted on stamps. How wonderful that the lighthouse keeper can now act as tour guide and describe his job/life to so many people. Many of lighthouses are being decommissioned and the gov't wants to sell them. The Lighthouse from Port Cartwright is very modern looking! Yes I noticed the very modern looking one too. To me, lighthouses also represent a community looking out for other people, specifically those on the open sea. I never knew there were so many different styles of lighthouse, I really like the black and white checked one. The black and white checkered one is pretty cool - I also really like the red and white striped one. A fascinating post with so many lighthouses depicted on the stamps. Now I'm looking to see if the UK have issued any. Glad you found it interesting, Bob! I will look forward to hearing how your investigations on British lighthouses goes. I like the winding staircase depiction in the first stamp. The maps are a great idea, nice to see a location. There look to be lots of lighthouses in Australia for you to hike to. My local lighthouse on Walney Island has been unmanned and automatic since 2003 or should I say unwommand because it was run by the only women principal keeper in Britain. It must have been a good life because she didn't retire until she was 74.